Providing world-class, patient-centered care for a seven-county region in western North Carolina, North Georgia, and East Tennessee. 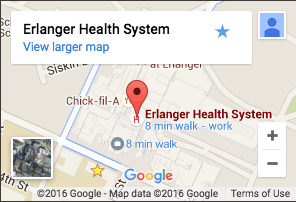 Murphy Medical Center is now Erlanger Western Carolina Hospital. Our shared goal moving forward is to provide world-class healthcare for the 45,000 residents we serve—while offering access to specialized resources unique to a major academic health system. We offer a full spectrum of inpatient and outpatient services ranging from cardiac rehab to radiology to 24-hour emergency care. Practices include family medicine, general surgery, multispecialty clinic, OB-GYN, orthopaedics & sports medicine, and urology. Facilities include 25-bed critical access hospital as well as wound care, urgent care, and athletic/rehabilitation centers.